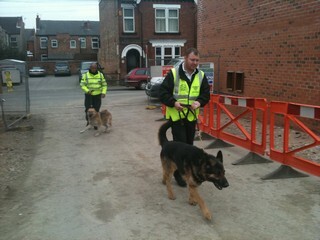 Our Security Dog Handler teams are trained to NASDU standards. This provides a professional asset in more vulnerable and higher risk situations as well as providing an excellent visual deterrent. These dogs are able to quickly identify intruders by scent, sight or sound. The dogs protect their handler by standing their ground, showing controlled aggression when confronted with threatening behaviour. A trained dog will help the Security Officer to defend himself from potential attack, and gives the Officer confidence to work in more vulnerable areas. An intruder is more likely to surrender when confronted by a dog team. The Security Dog Units are able to detain a suspect until the authorities arrive to deal with the situation. 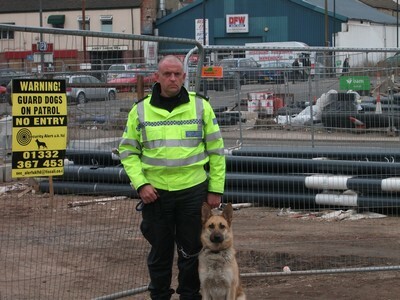 Our Security Dog Units work on many jobs ranging from building sites to large public events and festivals throughout the UK.